Festival lover? Well this is the perfect gift for you and your festival loving clients. A Waist bag which is perfect for storing personal items during outdoor activities . With your logo clear on the front zipped compartment you can promote your business while jogging, at a festival, or even just doing outdoor activities. They are perfect during the summer time to carry your phone, wallet, keys etc...Especially if you don't fancy carrying a bag around! Prices range on the quantity! Are you interested in trying out our waist bag to promote your business? Then why not find out more about our Promotional Waist Bag by contacting us. 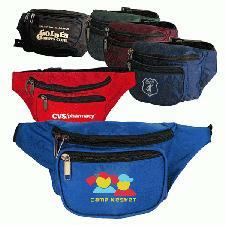 Or if the Promotional Waist Bag doesn't tickle your fancy we have plenty other Promotional Items Click here. We also do a range of Summer Products Perfect for going away with kids and the family or even just to get your customers feeling summery! Why not check out those as well whilst you decide what colours and how you want your logo to placed on our Promotional Waist Bag.